Although vaccination has made polio virtually non-existent in many parts of the world, it is still a problem in several countries. According to the World Health Organization, Afghanistan, Nigeria, and Pakistan are the only three countries that have not stopped transmission of polio. With a goal of completely eradicating the disease, Rotary has established October 24 as World Polio Day each year, and at Amazing Wristbands, we hope they achieve that goal soon. The Centers for Disease Control and Prevention say that polio is a virus that spreads through person-to-person contact. Although many cases show no symptoms, others feel flu-like symptoms that go away on their own in a few days. In worst-case scenarios, the virus invades the brain and spinal cord and can cause paralysis. The World Health Organization notes that, of those paralyzed, five to ten percent die. However, we’re getting closer to living in a polio-free world, simply by getting more and more children vaccinated. The major goal for the World Polio Day is to raise funds—which is made better by the fact that the Bill & Melinda Gates Foundation has pledged to triple each donation made. This year, the best way to help is to collect some funds for the cause. One easy way would be to sell goods such as silicone wristbands or key chains and send the proceeds to Rotary. You can customize the color, width, and style of the bands, and you can even add fun elements like glitter or glow-in-the-dark effects. 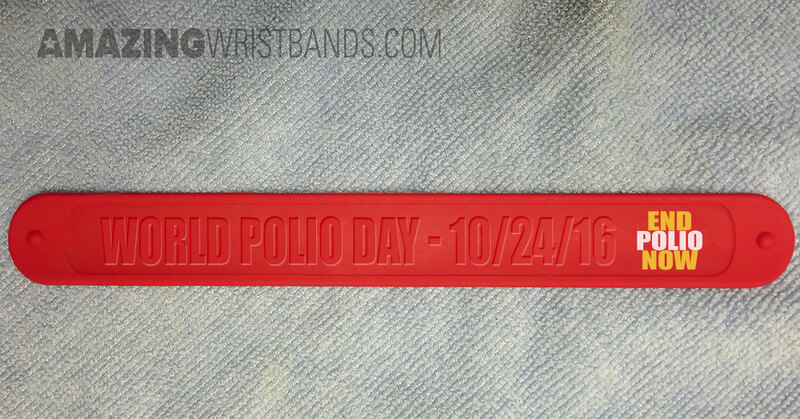 Plus, you can add imprinted messaging like “End polio” or “Support polio eradication”. The catchier you make the wristbands, the more you’ll be able to sell and the more proceeds you’ll be able to send to help end this debilitating disease! The more unique you make them, the more popular your bands will become. At Amazing Wristbands, we offer 100% latex-free wristbands, and all of our silicone products are non-allergenic. We offer free shipping, free artwork, free design, and free color matching. There are no minimum order requirements on our most popular styles, and your custom bands will ship within 5 to 10 days. Build them today with our easy online tool!